On December 7, 1967, a press release went out announcing the creation of the Office of Continuing Studies at Rice. The goal was to offer educational opportunities to adults in a rapidly changing world, focusing on science and technology. 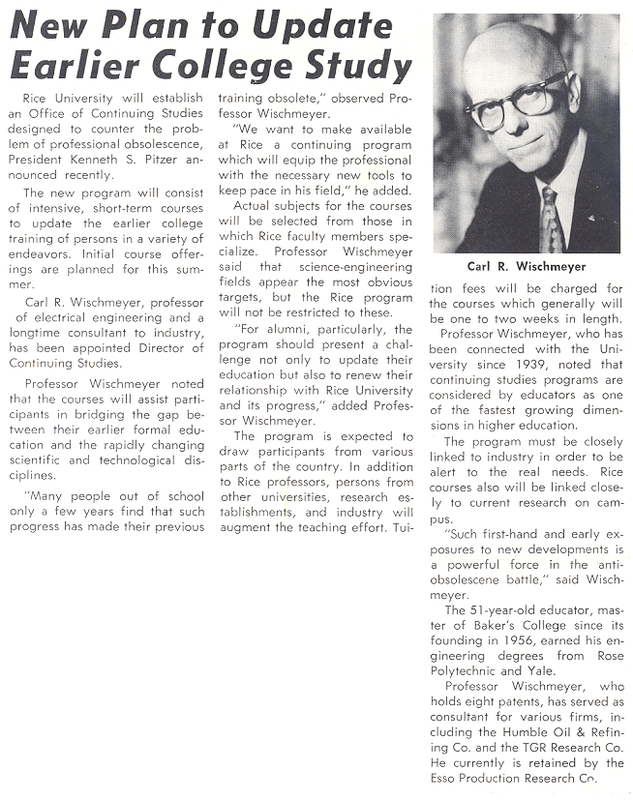 Carl Wischmeyer, our first director and professor of electrical engineering, foresaw that the Rice program should not only be restricted to science courses, and we grew to offer intellectual enrichment courses on a variety of subjects. The story was picked up by the Houston Chronicle, the former Houston Post and Rice’s Sallyport magazine. Wischmeyer led the continuing studies effort until the fall of 1968, leaving Rice to become the director of education for Bell Telephone Labs in New Jersey. He remained a friend of Continuing Studies, attending both our 30th and 35th anniversary celebrations and served on our advisory committee for programs held at the Hallmark Retirement Community. He passed away in October 2009 at the age of 93.